Shri Mataji: "I have to warn all the SYs ... Sahaja Yoga is the Last Judgment"
“In between Jesus Christ and His destroying Incarnation of Mahavishnu called as Kalki there is a time given to human beings to rectify themselves, for them to enter into the Kingdom of God, which in the Bible is called as Last Judgment. "Now this is the Last Judgment and those who miss will miss in any case. Christ has said," You will be calling Me Christ, Christ, but I will not recognize you.” "
"If we have to change this world, and if we have to save our people from complete destruction, we have to take to wisdom, and that is only possible when the brain is enlightened by Kundalini. This is what is very important today, when we see that this world is on the verge of destruction. Of course, the Creator himself is very anxious to save us and that is why he has in these modern times which are called Kali Yuga, made the all-pervading power activated. "But in a way is good because this is Last Judgment. If by marriage, by temptations, by wrong doings, by conditionings if you have to go out, you have to go out. But what would it has done to anyone? Mais quels bienfaits a-t-elle apportés â qui que ce soit? “This is the most important time because Sahaja Yoga is the Last Judgment. It is fantastic to have this, but that's a fact and is the truth, though you can understand that Mother's Love makes it very easy for you to get through your realisation, and that the whole story of the Last Judgment looks such as horrifying experience, has been made very beautiful and very tender and delicate and does not disturb you. “The Truth which is absolute has to express itself in these Modern Times. And even if it is not accepted it will never die. On the contrary, if it is not accepted, it will expose all falsehood and destroy it!" “Jesus Christ incarnated to open the Agnya Chakra and to dissolve our ego. My job is to awaken your Kundalini Power so that it could pierce your Sahasrara Chakra. This work is of a collective nature. I have therefore to do it in the case of one and all. I want to tell you about Jesus Christ, Guru Nanaka, King Janaka and a number of other incarnations and the way they relate with the Collectivity. Similarly, I wish to talk to you about incarnations of Shri Rama, Shri Krishna, etcetera and also about Shri Shiva because all the Powers of these Gods and Deities are in us. Now the Time has come for Collective Consciousness to manifest. “The word Kalki is actually an abbreviation of the word Niskalankh. Niskalankh means the same as My name is, which means Nirmala, that it is spotlessly clean. Something that is spotlessly clean is Niskalankh - without any spot marks. Now this incarnation has been described in many Puranas as will be coming on this Earth on a white horse in a village of Sambhalpur. They call it Sambhalpur. It is very interesting how people take everything so literally. The word Sambhalpur means bhal is the forehead; sambhal means at that state. That means Kalki is situated at your bhal. Bhal is the forehead and here He is going to be born. That is the real meaning of the word Sambhalpur. “So that Mahamaya is acting all the time, but that's the only way you can judge people. This Last Judgment is not an easy thing and even if you put thousands of judges they cannot do this Judgment - all the time you have to know what is what. And somehow I know everything but I will never show that I know. That's how I work it out and gradually I know what I have to do about that person. But that's the Love of your Mother that She wants to save as many as possible all that are created on this Earth, to give them their Resurrection. This is a Special Time!" “Sahaja Yoga is the way of Nature, is the Way of God. He has given you the right to be that. It is your right that you get it, that you establish your Self in your own doing ... So you have to grow into it. Then you will enjoy and that is the Kingdom of God which is being promised to you in which you will feel Collectively Consciousness. That is what it is and that is the Last Judgment which has been talked [about]. How are they going to judge you? Are they going to weigh you on a scale? ... Think about it — How are they going to judge you? The Judgment is Here!" “But these are special time, the Blossom Time. They call it the Last Judgment, you can call it the Resurrection Time, you can call it the Qiyamah, they call it in Koran. It is said that people will come out of their graves and will get their Resurrection. I mean what is left to the graves is nothing but a few stones and a few bones. No. All these souls which are dead will take their birth, take human body and take their Realization in these special times. This is a sensible thing to say and is also happening. “You cannot force on the organization of God anything. He is on His own, His organization is on His own. Only thing you can do is to enter into His Kingdom and become a part and parcel of that blissful domain. You would never like to change it either. It is so wonderful. It is so protective, it's so loving, is so gentle, so kind, so compassionate, that you would hate to change that organization, but we do! We try to organize God. Across the crowd, I suddenly caught a glimpse of His mother, Mary. 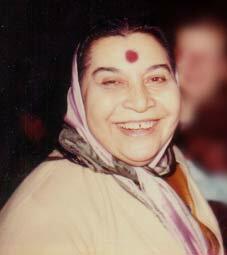 Shri Mataji: "I have to warn all the SYs"